Trestle tables are a real delight: they are a showcase for a large field of gorgeous wood up top, and the joinery underneath is big, beefy, and relatively simple. But they have a downside: the oversized legs and feet can look cumbersome and heavy. 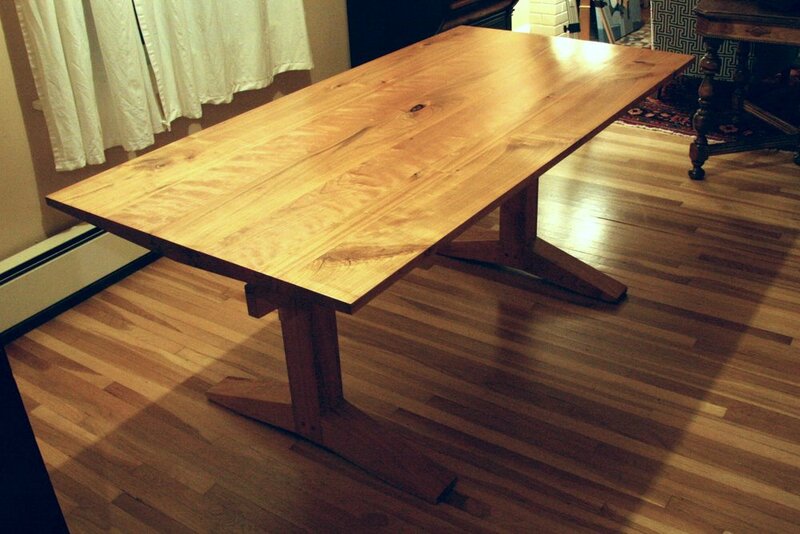 I tackled this project with the idea that I wanted to make a large trestle table that still looked light and nimble. When I design furniture, I often think about its posture as if it is a person. Is the table crouching? Is the chair sprinting? Kneeling? Is it calm, is it poised for action, or has it already leapt at you? For this trestle table, I imagined a classic ballet pose. En pointe, up on the toes, with arms stretched above. I wanted all the lines to be pulling the weight upward. The arched foot, the angled arms, and the v-shaped tabletop profile all combine to give this table a nice, light appearance. The benches were designed to match. Mini copies of the table’s structure would have been possible, but looked top heavy and unbalanced. Instead, I took the light triangles of the table’s arms and turned them downwards — keeping a balanced tension in the design.